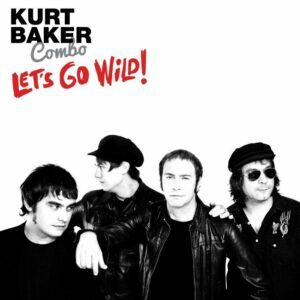 Portland native, now based in Spain, and Steven Van Zandt favourite Kurt Baker releases his new record, Let’s Go Wild!, with his current band, the Kurt Baker Combo. More of a mixed bag than his previous work, but when it hits, it strikes hard. For those who don’t know, Kurt Baker is a real workhorse of a musician, having released over twenty albums with his various projects and as a solo artist in just the last fifteen years. His latest album, Let’s Go Wild!, with his current band, Kurt Baker Combo, further cements his glorious powerpop stylings, full of hooks and melodies in the vein of his clear heroes, the likes of Elvis (Costello, of course!) and Joe Jackson. The addition of his aforementioned Combo has seen his songs take on a more garage sound lately, while still retaining his deep desire for his chosen genre to be pushed to the fore. When the band hit the right note, the album produces some cracking slabs of glorious powerpop, but his desire to bring in a wider array of influences has some mixed results. Kurt Baker pins his powerpop heart firmly to his sleeve from the off with a cover of So Lonely, originally by Sweden’s The Radio. It’s a Hamburg-Beatles blast of pop call and response harmonies that harks back to his earlier work. But this latest record draws in broader sounds than his previous outings. It’s made clear from only the second track, Foolish Stuff, whose rhythm pounds and bounds along with Sweet-like glam spiritedness, before No Fun At All rockets in over a more driving blues rock structure, although the powerpop is always bubbling under the surface. It’s a potent opening trio that perfectly encapsulate the sounds that the album as a whole are aiming for. The stronger songs on the album are definitely the ones where the band stay with Kurt Baker’s original idea of aiming to be crowned the most prolific powerpop prince. Beg To Borrow sounds like a take straight from Joe Jackson’s Look Sharp! with just the right blend of Costello-like melody and an unhurried yet captivating rhythm. Yesterday Today is a certain album highlight, the production allowing space for the vocals to shine and the addition of keys under the song add a delicate touch that other songs on the album may lack. Sick Of Waiting kicks up a great powerpunk groove more akin to Baker’s other full band projects and hits the right note, just like Don’t Say I Didn’t Warn You, which rockets along and shows that he certainly has an ear for hooks. The mid-song break down allows for a wonderfully subtle build up into the song’s closing chorus. Naturally, over so many albums and songs in the last decade and a half, there’s bound to be the odd misfire, where he doesn’t quite hit the bullseye. On Let’s Go Wild!, it comes with songs like Gotta Move It. The 70s style glam stomp is great, but the busyness of the production means that the guitars don’t shine as they should and the song almost seems buried in its own sound. That said, the idea is certainly still there, even if you have to strain more to catch it. The title track itself also feels like an unfinished idea, an intro that could have broken down into a great rhythm and melody that unfortunately doesn’t catch fire as it should. Although the album has a couple of tracks that could have done with a little more attention on the production, and naturally his incredibly prolific writing will occasionally result in a few perhaps rushed ideas, overall Let’s Go Wild! is a good addition to Kurt Baker’s canon. As the man himself if known for saying, “Have a good time all the time.” He certainly is! Let’s Go Wild! is a strong album that clearly exhibits where he’s been, where he is, and where he may go. Although the destination remains unclear, the Kurt Baker Combo may do well to remember the old adage that home is where the heart is. All words by Nathan Whittle. Find his Louder Than War archive here.